The Ancient Lake Junin has its own flightless grebe, rail, and frog. It is big and highly variable when it comes to accessing bird habitats. Luckily, there is a resident birding guide who can make finding the local specialties easy. After Lake Titicaca, Lake Junin is the second largest and the highest large lake in Peru. Located at an altitude of 4078 m Lake Junin draws water from an approximately 1800 km2 catchment area of the puna zone of Junin Province in central Peru. The lake is about 28 km long and 13 km wide at its broadest point, but rather shallow. It is only 1 to 3 meters deep over most of the area with only 11 to 12 m deep in the deepest parts. Junin Rail Photo: Cesar Zeballos. The Lake’s area is highly variable ranging from 150 to 400 km2 depending on the amount of water present. The average water surface is fringed by a belt of reeds and rushes of up to 6 km wide in parts of the lake. When the water level is high, usually between June and October, most of the fringing reed, rushes, and surrounding pastures are flooded making access to the prime bird habitats rather difficult. The best time to visit the lake is outside the wet season. Choosing the driest months to visit Lake Junin is always a good idea. There is a rich assortment of Andean ducks, coots, and other waterfowl. But the specialties are the endemic Junin Grebe and Junin Rail. The grebe was once common throughout the lake and seeing it was not a problem. Years of heavy metal contamination from mines located in the lake’s water catchment area has resulted in a steep decline of the grebe population. The grebe is now restricted to portions of the lake that are least affected by polluted discharges from mines within the lake’s catchment area . 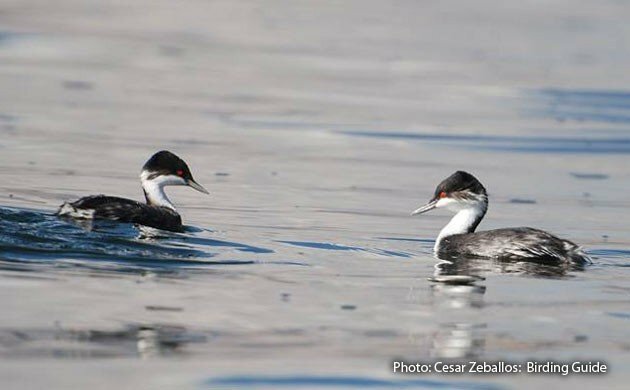 From thousands of birds throughout the lake, Junin Grebes are thought to range between 80 to 300 birds. 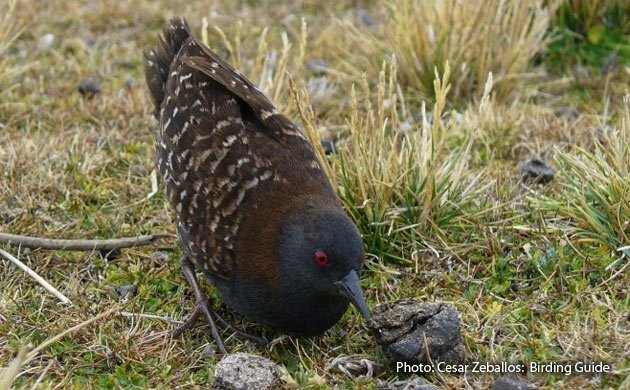 The Juni Rail is considered by some to be a sub-species of the wide-spread Black Rail. The rail seems less affected by the pollutants. It occupies most of the lake’s fringes, but it is so small and secretive that finding it can be a challenge, even in the dry season. Going after the rail during the wet season would be a real challenge. Getting to Lake Junin from the capital city of Lima takes only a few hours. Most people visiting Lake Junin stay in the town of Tarma, which has better accommodations. 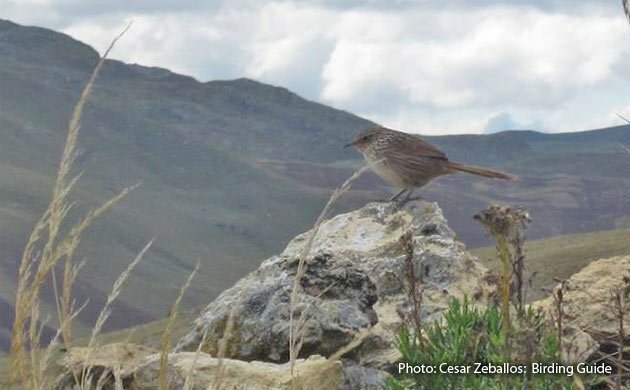 An entire day would be recommended to explore all habitats, including the puna grasslands and Andean scrub of the surroundings. The Junin Grebe can be seen from the shore with the help of a spotting scope, but it is recommended to take a boat and see it at a closer range to positively tell it apart from the very similar Silvery Grebe that also occur in the lake. The rail may be trickier. It is widespread around the lake, but identifying a place to look for it may be a challenge. Being among the most difficult birds to see, expect a glimpse of the rail as it moves across a clear paths in the thick rushes. There are a bunch ground tyrants, negritos, miners, canasteros, and pipits on the pastures, puna grasslands ans Andean scrub that surround the lake. Llamas and wild guinea pigs are also found here. The best move would be to enlist the help of Cesar Zeballos Bashualdo. A local birding guide born and raised at the very shores of Lake Junin. Cesar has the local knowledge to find every bird in the area. He can also arrange the boat trip to see the grebe and has favorite spots and playback equipment to work a good glimpse at the rail. Connecting with Cesar is not difficult. He is active on Facebook and well known at the village of Ondores. The vistas and unique birds of Lake Junin make it worth a visit. Feature Photo: Junin Grebe by Cesar Zeballos. Where to Watch Birds in Peru by Thomas Valqui. Alfredo lives in Florida but grew up alongside Peruvian Meadowlarks and Marvelous Spatuletails in Peru. Trained as Wildlife Biologist, he divides his time between South Florida and the tropics where he spends a fair amount of time. 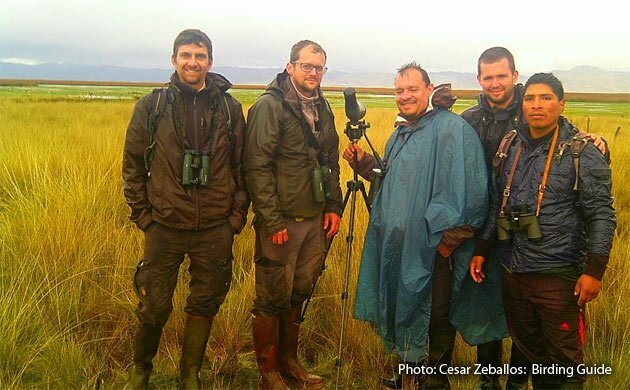 Alfredo founded Surbound , a blog on mission to connect the birds, wildlife, people, and magnificent landscapes in the Americas. Can Birds Be Safe? If Only. You Should Go to the American Birding Expo! Where Are You Birding This Second Weekend of July 2012?